A darker side of the fashion industry is currently being revealed through a trend known as fast fashion. After SOS notes were found in clothing bought at Zara and other large retail stores, the conditions under which clothes are currently being created came under the spotlight. The notes in question were reportedly slipped into the pockets of in-store garments by workers at factory plants in Istanbul, begging consumers to help them in their campaign for better working conditions, and to get Zara to pay them the wages they were owed. A report by The Guardian states that the factory in question was shut down overnight, leaving the workers unpaid. Fast fashion, which entails the process whereby products and designs move quickly from catwalks to the stores and retailers, is affecting a number of areas negatively, while advancing problems such as child labour and human trafficking. What are the ethical elements of this issue? An unprecedented demand for clothing on a worldwide scale is resulting in global clothing brands continuously requiring large numbers of new clothing items, and making use of factory plants that are unethical in the creation of their products. The first area that is being affected is the lives and health of the workers in factory plants supplying these retailers. According to an investigation conducted by Forbes, in countries that engage in mass production of these items, little is done to protect the workers and underage persons employed by this sector. Consequently, women and young workers are trapped into poverty. Some of these workers spend 14 hours a day in sweatshops in exchange for $3, while having to deal with sexual harassment. Brands such as Inditex (parent company of Zara), Marks & Spencer, ASOS and H&M were additionally found to be buying their material from Asian factory plants that are guilty of contaminating local rivers with carcinogenic run-off. In fact, an investigation by the Changing Markets Foundation reported that locals in West Java were contaminating the river’s waters and exposing the community to various toxic chemicals by simply washing their clothing in the water. This type of industrial pollution led to local families reporting new cases of cancer and a number of birth deformities. The dyes used to color the clothing in businesses that specialize in fast fashion usually contain toxic chemicals such as nonylphenol. When this chemical comes into contact with the body, it’s not only bio-accumulative, meaning it builds up in the body, but it’s possibly linked to allergic reactions too. According to a study published in the Journal of Soil and Sediments, in aquatic environments, nonylphenol is toxic and results in harm to organisms living in the water. So, not only can this be disastrous for the areas where these factory plants are located, but it can have a particularly negative effect on the fish and other organisms that inhabit the surrounding rivers and lakes. While the use of nonylphenol is strictly prohibited in the European Union, most large fashion producers are located in countries that allow these chemicals to be used. This leads to unethically sourced, harmful clothing being sold in local fashion outlets worldwide, at extremely low costs. Moreover, because there is a limited amount of time available for creating fast fashion items, the quality of the products takes a back seat. Whatever is left from these items ultimately becomes wasted material that ends up in the rubbish. And being non- biodegradable, it floods landfills, and leaves toxic chemicals and dyes to contaminate local soil and groundwater. What can consumers do to stop fast fashion from spreading? In the 21st century, our relationship with fashion and garments differs greatly from what it was two generations ago. Our wardrobes are larger and our clothes cost less – but they also don’t last as long. Mass consumption has removed us almost entirely from the manufacturing process – unlike previous generations, who would either know the tailor or fabric producer responsible for making their clothes, or made clothing themselves. Today, shoppers see only the item they pay for, not the thousands of hands needed to make it come to life, before it landed in their closet. On 9 September 2016, the Prince of Wales, as patron of the Campaign for Wool, in association with Marks & Spencer, hosted the historic Dumfries House Wool Conference in Scotland. The conference brought together 250 leading members of the wool industry supply chain, from farm to store, to discuss the current challenges facing wool and how its further use can benefit the planet as a whole. In his address to the conference, he officially endorsed the Dumfries House Declaration. This is a 10-point declaration of intent to support an environmentally responsible, sustainable and commercially viable wool industry. The document, created in conjunction with the Campaign for Wool and the International Wool Textile Organization, seeks to become the recognized standard of best practice in the wool industry. What has followed are global awareness initiatives led by the Campaign for Wool. One such initiative is the production of the award-winning documentary, Slow Down Fast Fashion, and South Africa is part of this. Click here to find out more about this documentary and campaign. Locally, Cape Wool sponsored a competition at SA Fashion Week 2017 to raise awareness of the importance of using wool. It also supported the Slow Down Fast Fashion global initiative with a panel discussion and the screening of the documentary at the fashion showcase. The video, which can be found on YouTube, is great viewing for any conscious consumer. Here is how you can do your part to minimize the damage of fast fashion, improve sustainability and look after your health. 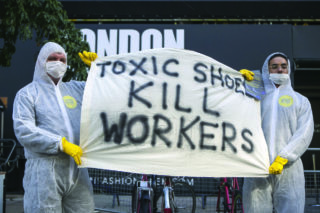 Support the initiatives of companies that work to eradicate fast fashion’s negative results, such as the Shwopping campaign from Marks & Spencer or Nike’s high-performance sportswear made from recycled plastic bottles. Focus on quality, not quantity. If you do a decent inventory of your wardrobe, chances are you will realize that many of the items aren’t being worn. By curating your closet, you can stop spending finances on items you won’t use anyway and choose clothing that will benefit you for longer. Demand transparency from your favorite retailers. The hashtag #WhoMadeMyClothes has done much to increase awareness of consumers’ responsibility and encourage the public to research their shopping beforehand. By supporting retailers that take their corporate social responsibility seriously, you can do your part to minimize the damage done by fast fashion on our health, the environment and human rights. Click here to find out more about this serious ethical, health and environmental issue.